Ful wys is he that kan hymselven knowe!. Geoffrey Chaucer (c. 1343 – October 25, 1400) was an English author, poet, philosopher, bureaucrat (courtier), and diplomat. 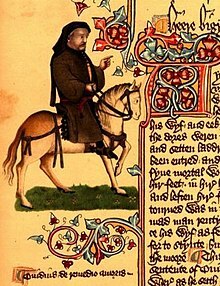 Chaucer is most famous as the author of The Canterbury Tales. He is sometimes credited with being the first author to demonstrate the artistic legitimacy of the vernacular English language, rather than French or Latin. Right so soun is air ybroke. For I am shave as neigh as any frere. Beeth hevy again, or elles moot I die. Of harmes two the lesse is for to cheese. How sobreliche he caste doun his yen. Encressen gan desir, of which he brente. The earliest known near-usage in English of the proverb "Great oaks from little acorns grow." And it remembren, whan it passed is. Eke wonder last but nine deies never in toun. For tyme y-lost may not recovered be. Go, little booke! go, my little tragedie! This world, that passeth sone as floures faire. He coude songes make, and wel endite. To maken vertu of necessitee. Yet hadde he but litel gold in cofre. Wide was his parish, and houses fer asonder. That first he wrought, and afterwards he taught. He taught; but first he folwed it himselve. And yet he had a thomb of gold parde. General Prologue, l. 565; referencing the proverb, "Every honest miller has a golden thumb". Or feinen thinges, or finden wordes newe. For May wol have no slogardie a-night. And maketh him out of his slepe to sterte. The smylere with the knyf under the cloke. That field hath eyen, and the wood hath ears. Ech man for hymself, ther is noon other. Deeth is an ende of every worldly soore. Of no degree availleth for to strive. And namely, that to us alle is due. Up rose the sonne, and up rose Emelie. Min be the travaille, and thin be the glorie. To maken vertue of necessite. For youthe and elde is often at debat. Yet in our ashen cold is fire yreken. The gretest clerkes ben not the wisest men. So was hire joly whistle wel ywette. In his owen grese I made him frie. Preesse on us faste, and thanne wol we flee. And too greet chepe is holden at litel pris. And for to see, and eek for to be seie. That hath but on hole for to sterten to. That he is gentil that doth gentil dedis. Ay fleeth the tyme; it nyl no man abyde. This flour of wifly patience. That may bothe werke wel and hastily. But if a man be vertuous withal. Taketh the morality, good men. Taketh the fruit, and let the chaff be still. Certes, they been lyk to houndes, for an hound whan he comth by the roser, or by other bushes, though he may nat pisse, yet wole he heve up his leg and make a contenaunce to pisse. Your duty is, as ferre as I can gesse. The emprise, and floure of floures all. For iii may keep a counsel if twain be away. Ne is no gold, as I have herd it told. Is to restreine and kepen wel thy tonge. Right as an aspen lefe she gan to quake. The father of English poetry. Chaucer, notwithstanding the praises bestowed on him, I think obscene and contemptible;—he owes his celebrity, merely to his antiquity, which he does not deserve so well as Pierce Plowman, or Thomas of Ercildoune. Chaucer was one of the most original men who ever lived. There had never been anything like the lively realism of the ride to Canterbury done or dreamed of in our literature before. He is not only the father of all our poets, but the grandfather of all our hundred million novelists. As he is the Father of English Poetry, so I hold him in the same Degree of Veneration as the Grecians held Homer, or the Romans Virgil: He is a perpetual Fountain of good Sense; learn'd in all Sciences; and, therefore speaks properly on all Subjects: As he knew what to say, so he knows also when to leave off; a Continence which is practis'd by few Writers, and scarcely by any of the Ancients, excepting Virgil and Horace. ... Chaucer follow'd Nature every where, but was never so bold to go beyond her. 'Tis sufficient to say according to the Proverb, that here is God's Plenty. One of those rare authors whom, if we had met him under a porch in a shower, we should have preferred to the rain. I read Chaucer still with as much pleasure as almost any of our poets. He is a master of manners, of description, and the first tale-teller in the true enlivened natural way. The pure well-head of poetry did dwell. This page was last edited on 17 May 2018, at 17:59.